An annotated list of 31 species of the genus Andrena newly recorded from Republic of Khakassia is given. Among them one species A. atrata Friese, 1887 is newly recorded from Siberia. Now the fauna of Andrena of Khakassia includes 32 species which is more that was registered in adjacent territories, namely Tuva (where 19 species was registered), Krasnoyarsk Territory (14 species), and Altai (10 species). We supposed to find more 10-15 species of Andrena in Khakassia, which should be spring and early summer species that did not present in this paper. Byvaltsev, A.M., Belova, K.A., Kupianskaya, A.N. & Proshchalykin, M.Yu. (2015). The diversity and abundance of bumblebees (Hymenoptera: Apidae, Bombus) in the steppes of Khakassia. A.I. Kurentsov's Annual Memorial Meetings, 26, 264–276 (in Russian). Gusenleitner, F. & Schwarz, M. (2002). Weltweite Checkliste der Bienengattung Andrena mit Bemerkungen und Ergänzungen zu paläarktischen Arten (Hymenoptera, Apidae, Andreninae, Andrena). Entomofauna, 12(Suppl. ), 1–1280. Kuminova, A.V., Zvereva, G.A., Maskaev, Yu.M., Pavlova, G.G., Sedelnikov, V.P., Koroleva, A.S., Neifeld, E.I., Tanzybaev, M.G., Chizhikova, N.M. & Lamanova, T.G. (1976). Rastitelnyi pokrov Khakasii. Novosibirsk: Nauka (in Russian). Kupianskaya, A.N., Proshchalykin, M.Yu. & Lelej, A.S. (2013). Contribution to the fauna of bumble bees (Hymenoptera, Apidae: Bombus Latreille, 1802) of the Republic of Khakassia, Eastern Siberia. Far Eastern Entomologist, 261, 1–12. Osytshnjuk, A.Z. (1977). Fauna of the Ukraine. Vol. 12. Bees. No. 5. Family Andrenidae. Kiev: Naukova Dumka (in Ukrainian). Osytshnjuk, A.Z. (1995). Family Andrenidae. Keys to Insects of the Far East of Russia. Vol. 4. Pt. 1 (pp. 489–527). St. Petersburg: Nauka (in Russian). Osytshnjuk, A.Z., Panfilov, D.V. & Ponomareva, A.A. (1978). Superfamily Apoidea. Key to the insects the European part of the USSR. T. 3. Hymenoptera. Part 1 (pp. 279–518). Leningrad: Nauka (in Russian). Osytshnjuk, A., Romasenko, L., Banaszak, J. & Cierzniak, T. (2005). Andreninae of the Central and Eastern Palaearctic. Part 1. Polish Entomological Monographs. Vol. 2. Poznañ, Bydgoszcz: Polish Entomological Society. Proshchalykin, M.Yu. (2013a). The bees of the tribe Anthidiini Ashmead, 1899 (Hymenoptera: Apoidea: Megachilidae) of Siberia and the Russian Far East. Caucasian entomological bulletin, 9(1), 147–158 (in Russian). Proshchalykin, M.Yu. (2013b). New records of bees (Hymenoptera, Apoidea, Apiformes) from Siberia. A.I. Kurentsov's Annual Memorial Meetings, 24, 135–148 (in Russian). Proshchalykin, M.Yu., Astafurova, Yu.V. & Shlyahtyonok, A.S. (2016). A review of the genus Melitturga Latreille, 1809 (Hymenoptera, Apoidea, Andrenidae) of the fauna of Russia and adjacent territories. Euroasian entomological journal, 15(6), 566–571 (in Russian). Sidorov, D.A. (2016). Contribution to the fauna of sandbees (Hymenoptera, Andrenidae: Andrena Fabricius, 1775) of the chern dark coniferous forests of Alatau-Shor highlands. A.I. Kurentsov's Annual Memorial Meetings, 27, 155–170 (in Russian). Sidorov, D.A. & Proshchalykin, M.Yu (2017). New records on bees of the genus Andrena Fabricius (Hymenoptera, Apoidea: Andrenidae) in the south of Eastern Siberia. 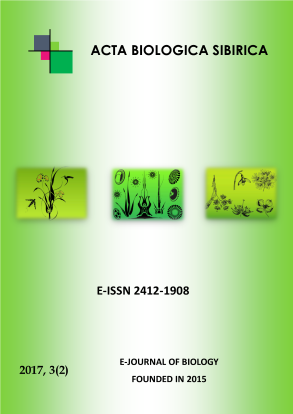 Eurasian entomological journal (in litt. ).